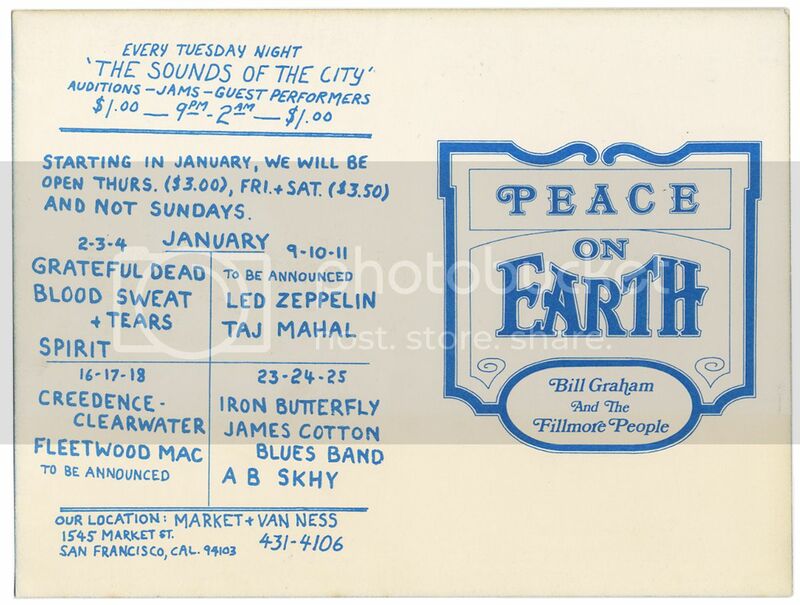 This is a rare BILL GRAHAM PRESENTS “JOINED” DOUBLE handbill/postcard mailer (#BG152-PC & BG153-HB) from concerts at the FILLMORE WEST and WINTERLAND in San Francisco, Ca. There were FAR fewer of these printed than either individual handbill. 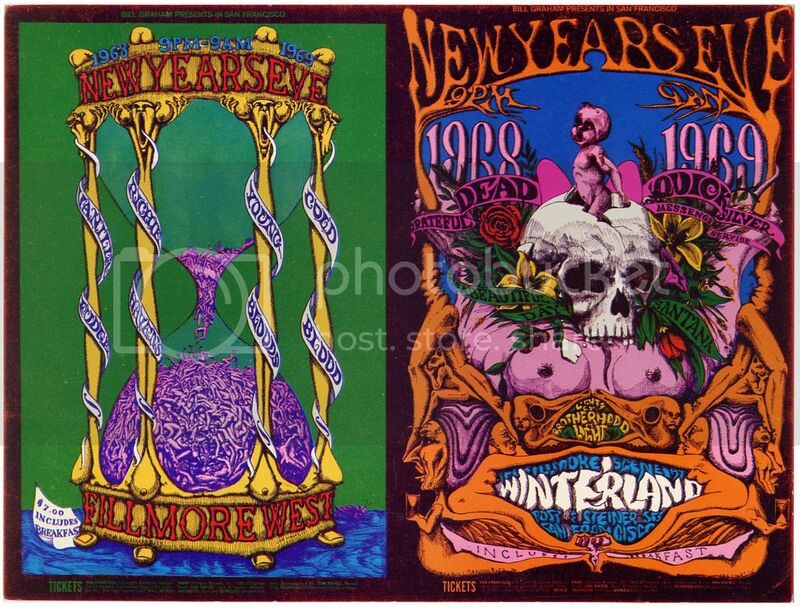 These handbills were for NEW YEAR’S EVE 1969 and admission INCLUDED BREAKFAST. The left side is VANILLA FUDGE, RICHIE HAVENS, THE YOUNGBLOODS & COLD BLOOD (Dec 31st 1968) and the right side is THE GRATEFUL DEAD, QUICKSILVER MESSENGER SERVICE, SANTANA & IT’S A BEAUTIFUL DAY (Dec 31st 1968). The mailer is in EXCELLENT shape with NO FOLDS, TEARS or PINHOLES! One small corner crease on the lower right along with some minor edge wear. BOTH designs are by illustrator LEE CONKLIN. This double-sized postcard mailer was printed once before the concert. It measures 7″ x 9 1/4″. Promoters created handbill versions of many of their posters and used them as handouts and fliers to promote upcoming shows. These handbills represent an important element of music history because they are unique marketing tools that are still used today. Another chance to snag a piece of music history. Categories: MUSIC, PAPER PRODUCTS, Handbills. Tags: collectibles, Cold Blood, New Year's Eve, Richie Havens, Vanilla Fudge, Youngbloods, Bill Graham Presents, Fillmore West, Grateful Dead, handbills, It's A Beautiful Day, music, Pop Culture, postcards, Quicksilver Messenger Service, Santana. Be the first to review “VANILLA FUDGE GRATEFUL DEAD SANTANA QUICKSILVER Fillmore West Winterland “JOINED” Mailer (Dec 31st 1968)” Click here to cancel reply.